Outdoor lighting should emphasize safety, atmosphere, function, and fun. The Green Scene in Northridge, CA. Outdoor Safety LightingThe first thing I look at when designing landscape lighting is safety. I look at lighting the steps and paths and I pay special attention to where the shadows will fall. I always want to light from the side or from below to make sure shadows don't obscure vision. On the steps, I prefer to use eyebrow or niche lights because they enhance safety and look great too. Pilaster lights are a good option too, but are often overdone in my opinion. Outdoor Security LightingOnce safety is addressed I consider security. I look for places where people could hide. Not only does lighting deter prowlers, it creates a feeling of comfort for guests as well. 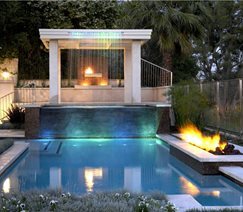 Dark pockets in a yard can present an undertone of fear , whereas a well lit landscape provides a more relaxing environment. How you feel about a space can be just important as how it looks. Landscape lighting can enhance security even after everyone has gone to bed. Many lighting systems offer the option of an inexpensive timer that includes an override system operated by remote control. A small remote can be kept by the bed stand so that if you hear a critter in your yard or someone walking across the lawn, you can turn on your landscape lights right from your bed. Instant "on" lighting can send a prowler running for the hills. Painting with LightWith safety and security issues covered the real fun begins and I turn my attention to the myriad of artistic effects that are possible with creative lighting. I use a variety of techniques and fixtures that can work together to paint a breathtaking nighttime scene. 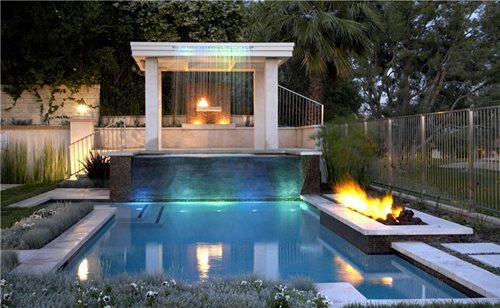 Pro Tip: Use lighting to invite people to explore and prolong the enjoyment of your outdoor space.